Massachusetts police are hunting for 19-year-old Dzhokhar Tsarnaev, who they say was the second suspect in Monday's Boston Marathon bombing. Tsarnaev's older brother, Tamerlan, was killed in a shootout with police. The two suspects are of Chechen descent. The FBI believes Tsarnaev could be driving a 4-door, green, 1999 Honda Civic with Massachusetts plates. 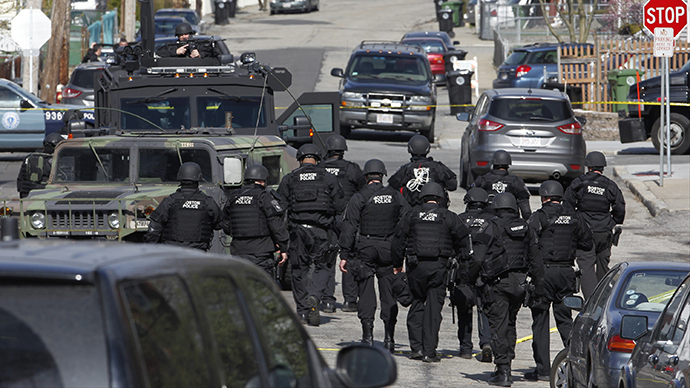 Boston police have ordered residents to remain at home, as they continue to search for the suspect. Numerous members of Tsarnaev's family have spoken to the media about the situation. His father, Anzor Tsarnaev, warned the US that "all hell would break loose" if his son was killed. 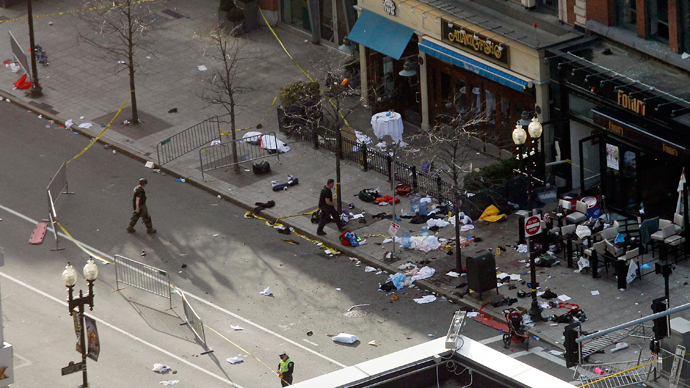 The FBI is questioning the suspects' sister, 22-year-old Ailina Tsarnaev. The woman told reporters that her brothers are "smart and great people" and that she "doesn't know what got into them." Meanwhile, the suspects' uncle, Ruslan Tsarni, has pleaded for Tsarnaev "to turn himself in and ask for forgiveness," saying that he is "ashamed" of his family members, who he claims he has not seen in many years. Earlier Friday, law enforcement cordoned off a two-block area in Watertown, Massachusetts - site of the deadly shootout between the suspects and police. Massachusetts state police said in a statement that "60-70% of Watertown has been covered, but the suspect has not been apprehended." Nearby resident Firaz Gliel described the situation to RT. "We were woken up at 3am by a reverse 911 call. The police told all the residents to stay put and not leave the house. Looking out of our window we saw masses of SWAT teams and police agents scouring all the backyards, bushes and streets. There are helicopters. The police seem to have isolated one particular area. The police were looking and talking to the suspect through a megaphone – this is where we are right now,"Gliel said. "Everybody is tense. No one can leave their house, all the businesses around here are closed. And we had a bomb threat yesterday, and then the marathon explosion before, so everyone is jittery. Everyone is in shock that something like this could happen in a relatively safe place, but the community has pulled together. People are helping each other out. So, there are both positives and negatives to what is going on right now," Gliel said. 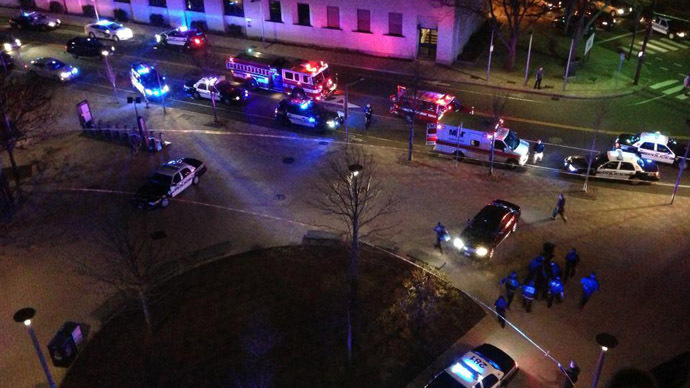 The firefight, which involved explosives, ensued after an MIT police officer was shot and killed on Friday morning, and fellow officers followed the lead of an apparent carjacking. The killed suspect, Tamerlan Tsarnaev, was wounded during the gun exchange with the police and was apprehended, police said. He later succumbed to the injuries. 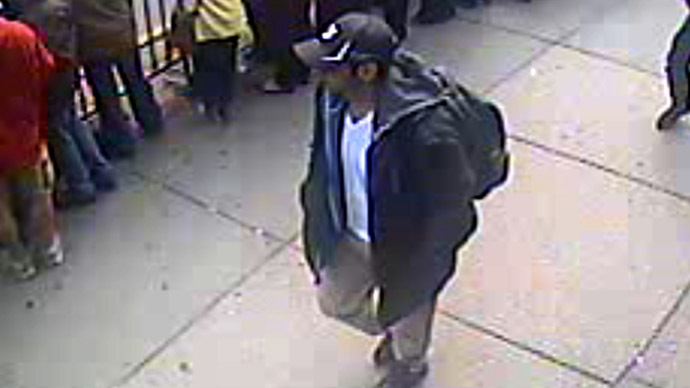 The suspect remaining at large is the FBI’s Suspect 2 in the Boston Marathon bombing, the so-called ‘white hat suspect’. Police called the man a terrorist, who is armed and dangerous. A 20-block perimeter was established as the manhunt for the second suspect continues. Unconfirmed reports citing police dispatch say the dead suspect had explosives strapped to his person and that the one on the run may have a similar device. Officials from the Beth Israel Hospital, where the wounded suspect was taken, say the man had gunshot wound and other injuries, likely sustained in an explosion. They didn't ID the diseased person. The police did not release the names of the suspects they confronted in Watertown. The FBI has released four more pictures of the Marathon bombing suspects, showing their faces from the front. Earlier the bureau published several pictures and a video of the two suspects. Jeff Bauman, the Boston Marathon victim whose grisly injury was replicated by photo-hungry news agencies, was the first person to identify a suspected bomber to the FBI. "He woke up under so much [sic] drugs, asked for a paper and pen and wrote, ‘bag, saw the guy, looked right at me,’" his brother, Chris Bauman, told Bloomberg. 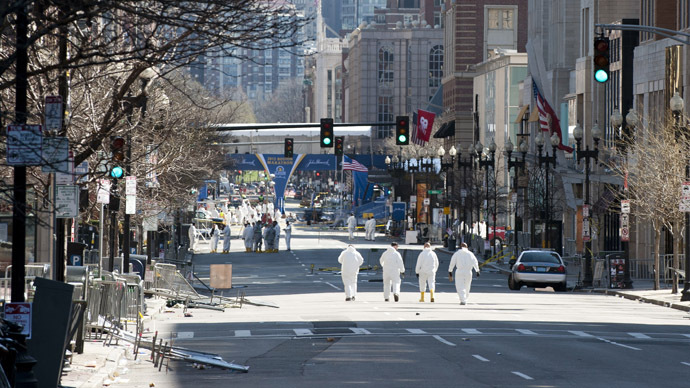 Bauman had been standing near the finish line waiting for his girlfriend to complete the Boston Marathon when a man wearing a baseball cap, dark jacket and sunglasses dropped a bag at his feet, according to his brother Chris Bauman. Less than three minutes later the bag detonated, with the blast mangling both of Bauman’s legs. While still in intensive care Bauman, 27, spoke with FBI agents and helped in the identification of the possible perpetrators – the same faces that investigators asked the public to help identify during a press conference on Thursday afternoon. He has survived the attack but both limbs were amputated below the knee. 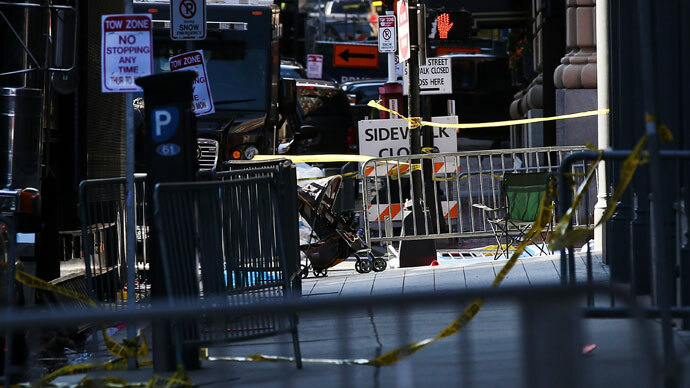 The man Bauman saw with the bag has since been identified as one of the Federal Bureau of Investigation’s two suspects in the bombing that killed three people and injured nearly 200 more.